One of the most reliable reversal signals is a head and shoulders formation. As the name implies, it is created as a result of three congestion areas. The first forms a shoulder, the second the head and the third a second shoulder. The head congestion is above the shoulders, which both form on the same support line and within the same basic range. In the case of a head and shoulders top, the reversal of a bull market trend is signalled. The projected target lower is the same distance below the neckline as from the neckline to the head. A break of the neckline not only signals a move to the target area, but also confirms the trend change and the start of a new bear market trend. Rallies are generally associated with increasing volume during a bull market phase, therefore when volume decreases on a market advance it can signal a potential reversal. The head section of the head and shoulders is often accompanied by decreased volume, relative to past advances. The right shoulder, too, often has very light volume associated with it, but the break of the neckline and the subsequent move lower will generally see volume increase. A break of the neckline will often see price retest the old neckline, which then becomes resistance, prior to the major move lower. 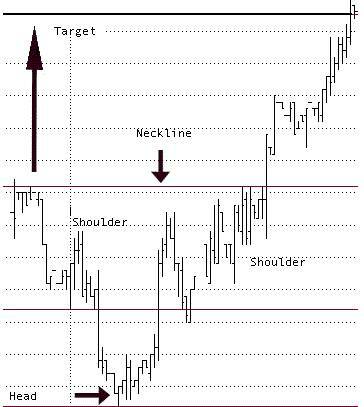 As a result there is often a second opportunity to establish a position if you miss the initial neckline break. In the example below, the second shoulder is still in the process of being formed, but one can already see the recognisable shape of the head and shoulders. As the name implies, this is the reverse of a head and shoulders top, so is upside down, and not as common as the head and shoulders top. It is formed as the result of three congestion areas. The first congestion creates the first shoulder, the second the head and the third the second or right shoulder. The head is lower than the shoulders, and the neckline is drawn across the tops of the shoulders. The head is generally wholly outside the range of the shoulders. The head and shoulders bottom signals the end of a down trend and a reversal of that trend, not just a change from trend to trading bracket, but also the beginning of a new bull market trend. This is confirmed by a rally above the neckline. The projected target is the same distance above the neckline as the distance from the low to the neckline. The relative volume associated with each decline or advance out of each congestion pattern is important, as is the volume from the previous declines. To confirm the formation as a head and shoulders bottom it is a requirement that the volume associated with the head is lower than the previous first shoulder. The rally into the second shoulder and the volume traded in the second shoulder should reflect the lightest volume of all.